Subway is set to launch the new Autumn Carved Turkey sub, featuring new Sweet Cranberry Mustard Sauce, starting October 10, 2016. They're also adding two new fall-themed cookies, including the Pumpkin Spice cookie, at the same time. The new Autumn Carved Turkey sub features carved turkey, cheddar cheese, Sweet Cranberry Mustard Sauce, spinach, tomato, and red onion on 9-Grain Wheat bread. 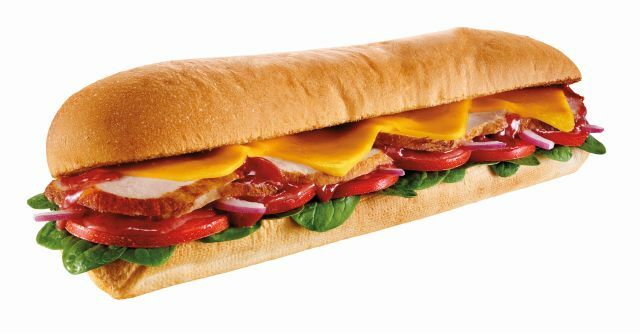 The suggested price for the sub starts at $4.75 for a six-inch and $7.75 for a Footlong. The new Pumpkin Spice cookie is made with pumpkin-flavored dough, vanilla, molasses, nutmeg, white confectionery chips, and cinnamon. There's also the new Apple Pie cookie which features chunks of Granny Smith and Fuji apples lightly coated in cinnamon as well as nutmeg, cloves, and natural apple flavor in the cookie dough. The fall themed items will be available for a limited time at participating locations nationwide starting October 10, 2016.